At OSI Vista we’re concerned with the impact of our business activity on our world. We strive to maintain a positive and sustainable relationship with the people, the communities and the environments we contact. We work to responsibly manage our business within the social, economic and environmental frameworks in which we operate while continually exploring ways to improve our sustainability impact. Food industry sustainability and our global supply chain sustainability are top priorities. These sustainability efforts are in force throughout our global network and have been recognized by the food industry. Our Mission is to responsibly manage our business within the social economic and environmental framework in which we operate while continually exploring ways to improve our sustainability impact. Vista OSI strives to drive sustainability efforts in the areas of: Human Health & Welfare, Animal Health & Welfare, Climate Change & Energy, Waste, Water, Land, Community Impact and Economics. OSI Vista was “recognized by one of the Key customer for Best Sustainability practices” for two of its sustainability projects. The project involving Production and Agricultural Practices was both educational and practical in nature, as OSI Vista worked with farm input companies to teach their growers about the efficient use and environmentally safe handling of farm chemicals and pesticides. The consumption of those materials has increased in Indian agriculture by more than 100% in the last two decades. This training resulted in approved pesticides being used by 100% of the farms used to supply Vista. The Water Conservation and Micro-irrigation Project involved the education of and assistance to vegetable growers (lettuce and tomatoes) to implement drip and sprinkler irrigation systems versus low-efficiency flood irrigation methods. This has led to lower electricity use, fewer weed problems and less soil erosion. OSI Vista was one of 51 recipients of the global honor out of 400 entries. 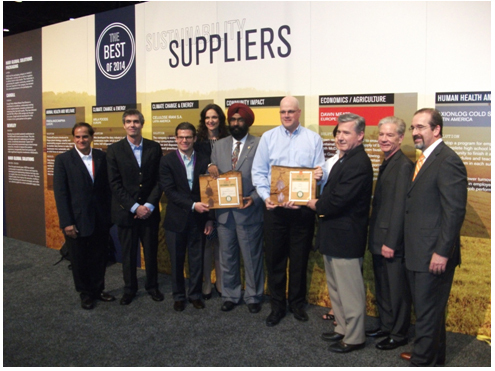 A panel of executives and external experts, including BSR, Conservation International, Food Animal Initiative (FAI) and World Wildlife Fund (WWF) of OSI Vista key supplier selected the final 2012 Best of Sustainable Supply winners. OSI Vista was named in 2014 Best of Sustainable Supply report for two of its sustainability projects for one more time. Discharge water exceeds the biological oxygen demand levels for agricultural use set by the local government, and the facility is rated a “zero” discharge facility because 100% of discharge is used for watering. The company uses the minimal sludge produced in the treatment as manure for a tree plantation and the lawn. OSI Vista is leading an effort to educate vegetable grower suppliers across India to help them maintain soil fertility and productivity. Vista has developed integrated crop husbandry practices, encouraging crop rotation and fallowing. In some locations, vegetables are an intercrop grown between perennial fruit crops like apples to conserve nutrients and add organic matter to the soil. Farmers have modified cultivation to suit the geography and climate. Micronutrient companies and university labs have helped provide training sessions for farmers in Integrated Nutrient Management (INM). OSI Vista supplier farms are increasing their use of organic manures, vermi-compost, micronutrients and bio-fertilizers to consistently improve in productivity and product quality, such as freshness and extended shelf life. A total of 51 entries were recognized from nearly 600 submissions received. Vista Processed Food Private Limited (referred to as “Vista” or “Company”) is an OSI (Otto and Sons’ incorporation) International group company located in APMEA Zone (Asia Pacific Middle East Association). OSI is entrepreneurial company with global interests majorly International in meat, poultry and other value added food processing activities and is one of the largest Meats processing Company in the world. Vista was incorporated on August 18th 1995, as joint venture and by year 2012, became 100% OSI Group Company. Vista produces various food products in world class processing plants across the country including in states of Maharashtra, Punjab and Andhra Pradesh. State-of-the-art food processing plants of Vista produces the vegetable and poultry in Separate processing lines for poultry and vegetable foods and separate fresh produce plants having Capability to produce ready-to-cook quick frozen foods under most hygienic and stringent sanitary condition meeting International standards, procedures and support services. The plants are certified under HACCP (Hazard Analysis & Critical Control Point)/ ISO 22000/FSSC 22000, Environmental ISO 14001:2004 HALAAL and other areas to ensure compliance with all national, religious and international laws & standards. Vista is a pioneer in processing formed and coated poultry and Vegetable product in the convenience frozen food and chilled fresh Vegetable processing industry. Vista supplies its products to major brands in domestic and international markets. At Vista, we are continuously working on product development and tapping possibilities for more products to satisfy the growing demand. With the food processing industry continuing to grow in leaps and bounds, our future plans for growth will be realized through broadening our range of products and continuing to build on our commitment to quality, which we demonstrate both in our constant work to improve existing products and in the careful monitoring what we do to ensure that consistently high standards of quality is maintained. The concept of Corporate Social Responsibility (CSR) has gained prominence from all avenues. Organizations have realized that Government alone will not be able to get success in its endeavor to uplift the downtrodden of society. With the rapidly changing corporate environment, more functional autonomy, operational freedom etc. Vista has adopted CSR as a strategic tool for sustainable growth. For Vista in the present context, CSR means not only investment of funds for Social Activity but also Integration of Business processes with Social processes. It has always been the endeavor of Vista to be at the forefront with regard to Social and Environmental responsibility. As a responsible corporate citizen, we aim to contribute to social and environmental causes on a regular basis. For us Corporate Social Responsibility (CSR) is an added opportunity to bring value to our stakeholders lives and in a small possible way bring about a difference that we all want to see and be. We have been contributing to society since various years. Vista has felt the need to establish the principles & coverage of CSR & has accordingly drafted this corporate social responsibility policy. Vista/ Company means ‘Vista Processed Foods Private Limited’. CSR Activities means the activities which are undertaken or to which allocation is made by the Company under this CSR Policy, as amended from time to time. CSR Committee means the Corporate Social Responsibility Committee of the Board of Directors of the Company. CSR Policy means this Corporate Social Responsibility policy of ‘Vista Processed Foods Private Limited’ as amended from time to time. CSR provisions means the regulatory provisions governing the CSR activities including the relevant section, rules and schedule under the Companies Act, 2013 or any other act or law as is applicable from time to time. The Policy shall be applicable to all CSR initiatives and activities undertaken by the Company for the benefit of the different segments of the society. The Company shall spend not less than 2% of its average net profits for the immediately preceding three financial years or such other minimum amount as specified under the CSR Provisions. Provided that the surplus arising out of the CSR Projects or Programs or Activities shall not form part of the business profits of the Company. The CSR initiatives/activities of the Company will be identified and initiated by the CSR Committee comprising 3 (three) Members of the Board. Subject to the requirements of the Act, the Board may increase or decrease the size of the CSR Committee by passing a Board Resolution. The members of the CSR Committee shall elect one of them as the Chairman of the Committee. The CSR Committee shall recommend to the Board the amount of expenditure to be incurred by the Company on CSR activities and the Board will ensure that the activities as are included in the CSR Policy are undertaken by the Company subject to and in accordance with the provisions of section 135 of the Companies Act, 2013. To formulate action plans to undertake CSR initiatives from time to time. To take stock of the progress of the initiatives and to monitor the implementation of the scheduled initiative. Eradication of hunger, poverty and malnutrition, promoting healthcare including preventive healthcare and sanitation and making available safe drinking water. Contributions and funds provided to technology incubators located within academic institutions which are approved by the Central Government. Collaborating with various Organisation , which are registered as a Trust or a section 8 company under the Companies Act, 2013 or Society or NGOs or any other form of entity incorporated in India that specialize in the aforesaid activities. - For the benefit of any particular political party, front or ideology. - For the benefit of any particular religion, religious belief or religious sect. - For the benefit of any particular caste or community. - For the sole benefit of employees of the Company. Also, the Company shall not make any allocations to or undertake any CSR activities which are outside the scope of the CSR provisions, especially schedule VII of the Companies Act, 2013. The CSR policy is implemented as per the Act and the Rules. The CSR policy is implemented ensuring that all projects/programmes as budgeted are duly carried out. CSR spends will be audited in an accountable and transparent manner. Reporting and review by the CSR committee twice in a year and by annual reviews by the Board. Evaluation will carried out and shall identify the difference between the achieved outcome and the expected outcome and the reasons behind the difference and corrective steps and any identify any good practices. There shall be clarity about the scope of the projects/programme and the need before evaluations are undertaken. CSR Committee will be authorized to decide whether it will be internal, external or third party evaluation. The Company shall publish its annual report on CSR Activities in its Directors Report in the manner prescribed under the Companies Act 2013 and the CSR Rules. This policy will also be available on the Company’s website as and when one is created. - Any term not defined in the CSR Policy shall have the meaning prescribed to it under any of the CSR Provisions. - The Board shall have power to amend / modify any of the clauses of the CSR Policy and they may do so either at a Board Meeting or by way of a Circular Resolution.